The Popes Global PR Tour. Words and action. Activists for any number of 'causes' are taking comfort in the words of Pope Francis. Memes are proliferating across the interwebs. Survivors around the Earth are not taking comfort in Pope Francis's words, nor are they impressed by the actions of The Vatican. The same can be said of survivors advocates, lawers, physicians, psychotherapists and close friends. The action that Survivors, survivors advocates, lawers and transcenders and humane decency require is that the Vatican hands over all it's documentation on clerics who have sexually assaulted, bullied, abused harmed defenceless children: from the initial allegations, through to investigations and the response of the Catholic Hierarchy and it's officials acting under it's umbrella in their dealings withe Survivors. That, and that alone is the missing element in the world wide process of Survivors seeking justice, resolution and probity with regard to their cases. And those that are taking their cases forward are a minority of the total caseload. Some say this refusal to open up is partly a matter of the Vatican's finances. Wealth hoarded, concentrated or sequestered is wealth taken away from the wider community. All wealth is generated from within the community at large. Including the massive wealth of The Vatican and national church organisations. It is not generated by individuals who are billionaires etc, no matter how the big the egos of celebrity 'entrepreneurs', politicians and fawning pundits waffle on about their 'wealth generation'. There are people who capitalise on the cheapened labour and the taxes of the grass roots, and they take a bigger share than they need or deserve, and they do not 'create' it. The workers create it, and the shoppers create it, and that service users create it. The fact is that great wealth has nothing to do with greed; it's a political utilitarian device that enables Political Power to exercise itself over people, in that so called 'economic decisions made by Governments are political, ideological rather than economics based on evidence, and such decision making exists in order to enhance, protect and project political onto others, the electorate and their children, who are seen as objects rather than human beings, with real feelings and experiences that matter. Private Military Contractors do not come cheap. The behaviour of The Vatican and The Irish Government towards both predatory clerics, and survivors, and the ECB in relation to Greece, and the DWP in relation to job seekers, disabled people and other vulnerable groups, amongst many others, makes this abundantly clear. Radicalisation, Power, Honesty and healing. In my 30s, I worked on healing and recovery and became, bit by bit, less angry,less abusive, less manipulative, less of a bully. Had I not, I might well have committed some crime of harm. As it was I did intentionally hurt other people in my life. As it was I did ignore the harms I caused. As it was I blamed those I harmed for making me harm them. These are all behaviours typical of terrorists. And as a result of my choice to seek recovery, to step away from those behaviours, and due to the good fortune of finding helpers whose understanding of these dynamics was evidence based, efficacious and empathic, it turned out that in time I became far more meaningfully radical, in as much as I focused my gaze of the psycho-social roots of my abusive behaviour, the root of the matter as it occurred in my life, and took personal responsibility for my actions and their consequences. Radical means 'get to the root'. If the Government REALLY wanted to 'tackle radicalism', then the evidence is that the healing route of truth and honesty, ring fenced by empathy and a deep care and concern for the welfare of all people in our Society, and in all other Societies across the Earth, and is by far the most efficacious. But that would be too radical for Power, because in the end it would expose the psycho-social and historical roots of Hierarchical Violence, and the symptoms of Hierarchical Violence would be seen as symptoms and not as the personal flaws and faults of those who are most vulnerable, and most wounded, and often most angry, and to would thus expose Power as we know it to the honest truth, and the choice to face that is the core element in all healing of abusive behaviours. That is a choice that Power as we know is refusing to make. It has been offered, time and time again, and Power has refused it. The latest event in that is the rejection by the 'troika' of the meaning of the Greek referendum result. Government executive, and Corporate Executive branches must step out of the jack-boots of distal power exercised over the people, into a new pair of shoes, the athletic shoes of a shared active participative responsibility of power with the people as equal partners. We, the people, must stretch every sinew, move every lever, roll every stone to forward this oh-so-basic, ethical and moral change over. The Power Inquiry 2004-6 looked at many aspects of this in great detail, and whilst the leaders of the Liberal, Labour and Tory Parties came to the 2006 Conference at Queen Elizabeth Hall, opposite the Mother of all Parliaments, in London's Westminster, and praised the work of the Power Inquiry, calling it the most important initiative in the UK regarding Democratic Power of it's time, they later dismissed it as 'impractical'. No engagement. Just a trite and brief dismissal. And then came 2008 and 'Austerity' (which had been planned well in advance of 2008) which was directed primarily at the Community Voluntary Sector and the people they serve, to undermine and punish that constituency, for their temerity in describing how Power can be safely devolved to the UK's grass roots, the tax payers, and the marketing Guru's of the Government called it 'Big Society'. Because 'we are all in it together'. And that is true, the three mainstream political parties are all in it together. And they are all committed to excluding the grass roots from meaningful participation in decision making on matters that affect our lives. Power is their God, and great wealth is more about utility than it is about greed, great wealth is a tool - it can be used as an oppressive or it can be turned to genuinely nurture a truly humane culture. The people are the subjects of Power. As long as this remains, the inhumanity of Power will remain. Voting on it's own was never truly democratic. The bullying must cease. The abuse must cease. The lies and manipulation must cease. George Osborne announces a new Minimum Wage whilst planning to remove Working Tax Credits, Child Benefits and other supports that poor, vulnerable people, many of whom are in work, but being paid low wages (to enlarge the profits of their employers) - a sleight of hand worthy of a bully - and the red faced triumphalist Tory parliamentarians crow, bellow and grunt their approval in a manner befitting a hyperactive sweaty crowd cheering a boxing match as their champion strikes his opponent down to the floor. A bit like the air punching of the Obama Situation room, when Osama Bin Laden was executed. What manner of men and women are these? Well, they too are 'radicalised', are they not? They pursue radical policies with enforcement actions that cause harm and they deny the meaning of that harm, they dehumanise those they have harmed and they justify their actions through bland ideological statements. Are they not similar to the 'terrorists' in this? Is it not a reasonable demand that they and the terrorists they claim are 'radicalised' desist? I have initiated a petition to hold a referendum, to give the entire people of the UK a Ggenuinely democratic opportunity to decide for ourselves whether or not the cuts being imposed, and the rationale under which they are being presented, has any standing as a fully democratic mandate. Hold a UK wide referendum on to ask if the people of the UK accept the basis of, and implementation of 'Austerity' as it stands. 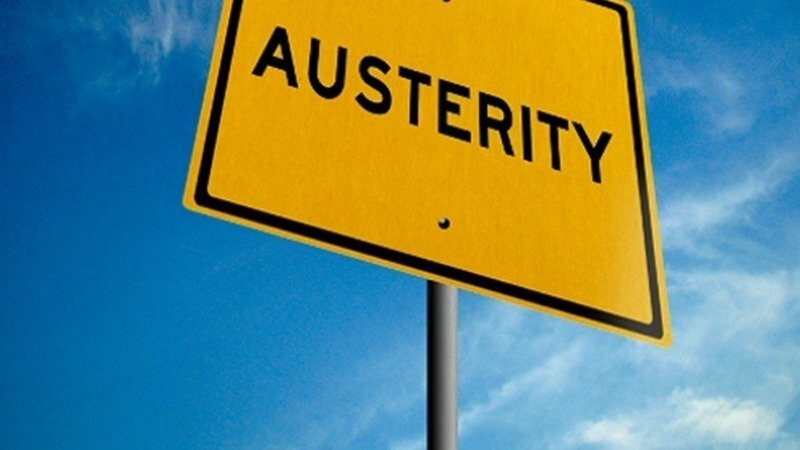 "The term 'Austerity' is being used to generic label for a series of legislative actions and policy implementations that are causing avoidable harms to real people's lived experience. From the closure of the Independent Living Fund, to privatisation of probabtion services, ideological interventions in Education, privatisation of our National Health Services, the sale of national long term National properties and resources for short term cash, the privatisation of security based public bodies, the reduction in humane public services provided by well trained, well paid professionals being replaced by for profit companies, and much else besides, is causing socially unacceptable harms across our Society. The rationale of these actions and policy implementations appear to be based on a misrepresentation of the situation with regard to Government use of the collective shared resource of taxation, and National Debt and an operating deficit. The Government that is implementing these policies, taking these actions and that is actively ignoring or denying the harms being caused, does not have a majority mandate within the electorate for 'Austerity' as it is being IMPOSED on the many of the most vulnerable people within the population of the UK, and having been less than forthcoming as to any detail as to what these 'cuts' would entail in practice, whilst assuredly knowing those details, for such matters are scoped out planned many, many months in advance, have not acted in good faith, and with a large segment of society protesting on our streets, online, in conversations at home and elsewhere there is an acute need to now ask the UK's people the question posed above, and to have us, the people provide the answer. For that is the true nature of Democracy, as the Greek people have just demonstrated. Now we demand that the Government become obedient to British, Scottish, Welsh and Northern Irish Democracy, the voices of the people, possibly for the very first time, and cease to play ideological power politics with our lives and our shared contributory resources, our taxes, and our most humane aspirations. Hold a UK wide referendum on to ask if the people of the UK accept the basis of, and implementation of 'Austerity' as it stands." There is a thread of extreme violence, of murder and torture gangs operating on behalf of the British and American Governments, on the pay roll of these 'elected, democratic' Governments, stretching from the Boer war's infamous concentration camps and counter insurgency, through WWI in Russia, and onto Northern Ireland's 'b' and 'c' specials in the 20s, to the slaughter of Greek nationalists by British forces who deployed and fought alongside Nazi collaborators after the Nazi's left Greece, to Kenya and the Mau Mau 'experience' and counter insurgency, to the use of the same tactics in Vietnam, Indonesia, Equador, Brazil, Chile, South Africa, Angola, Congo, and in Northern Ireland during the recent 'troubles', in Afghanistan, Iraq, Libya, Syria to this day. One the the key tools in their toolkit is the instigation and escalation of Lateral Violence, where people under an oppressive regime who feel relatively powerless to alter the situation lash out at others on their own level, in their frustration and carefully inculcated misunderdstanding of the true situation. Lateral Violence has both a brutal physically violent aspect and a bureaucratic aspect, as the DWP well knows. The adverse behaviour of stressed frontline staff towards disabled, poor and other vulnerable groups is part of this dynamic. The executive branches are all involved in this. Up to their noses in blood. They are not bothered by the stench of death. Their denials roll off their tongues, honeyed by the Official Secrets Act... and other legal instruments that protect them. So the Dalai Lama has to do what he does - he knows the game. Publicly he has retired the traditional Dalai Lama position of Political leader of Tibetan people, albeit in exile..
A political position of RULE that has existed since the 5th Dalai Lama, who was as ruthless as George Bush or Genghis Khan. As political RULERS apparently have to be. Why has he done this? What has changed? He remains part of the spiritual hierarchy. Fair enough. He talks about a new secularism that accepts the equal validity of all religions, with a hint that Religion ought to stand away from power politics. However he claims that the violence we see around the world is religious in nature, that it confounds the central tenets of those religions..... when he knows for sure - from direct experience of the Chinese invasion of Tibet, that the violence is always, always about political and commercial power interests competing with each other, quite unrestrained by table manners, in similar fashion to the behaviour of Jackals, Hyenas and Vultures jockeying for prime position at the remains of a corpse of a Wildebeest killed by a Lioness, with David Attenborough fawning over them. Except that that analogy is unfair to the animals involved, for that these human beings are doing, they do to their own kind. Intraspecies Predators. Attenborough's fawning 'interview' with Obama was one of the most revealing and disgusting pieces he has ever done. It says more about him, and his class, than the rest of his career. International Fight Club. Whose first rule is ..... don't talk about International Fight Club. Which is why they hate (and fear) John Pilger, Noam Chomsky et al. Future political leaders of Tibetan Buddhists may well be secular. That remains to be seen. And all those of us who HOPE that the executive level of international politics will change because compassionate charismatic leaders associate with them, that the compassion will rub off on them, are deluded: because unless we, the people, also take up the confrontation of our own national executives and remove the oligarchies through democratic means, the oligarchs will remain in power. Violence is their area of expertise, and they have NEVER been removed by violence. And so we, the people, must replace them. and that requires grass roots political organisation that is robust and dedicated to the task and absolutely honest about the situation. That is what The Power Inquiry was all about. Grass roots political organisation without a hierarchy or executive instructing the grass roots, rather a grass roots informing and instructing itself in political solidarity, through genuinely matured participative Democracy. And we will still have to deal with the gangsters, the men of violence. They will not be going away anytime soon. That's just the bog standard reality, the basic truth here. The Dalai Lama knows this. He knows, but does not dare say anything. Which is WHY he was so .... 'compassionate' towards George Bush, the war criminal, at their shared birthday party. His comments about education were probably the most radical thing he said in Glastonbury 2015. Any educational process that strengthens the heart and the mind is probably the core essential in resistance. In Greece, that education has been largely self education, as the youth accessed the worlds database for themselves over the past 15 years, and fully understand how the IMF fits into this picture of international Power Politics, of bullying and coercion, corruption and graft, bearing in mind that there are still many elders who lived through the British repression of Greek Nationalists after the Nazis left Greece,who saw how the British treated them and how they installed a monarchy and a capitalist elite oligarchy as the new Government. People who are a living witness to the realities of International Politics. And they are well organised, and they understand that the men of violence must be confronted, by removing the oligarchy through democratic processes. And remember, we must be extra vigilant when it comes to Lateral Violence, which I mentioned earlier. That same task is what is facing the people of England. It faces me every day. I cannot avoid it if I am to take my responsibilities towards my grand children, and their children beyond them seriously. No truly mature adult can avoid this task. The Neo-Liberal Revolution: indoctrination and economic sleight of hand at home, violence abroad. When Teresa May and David Cameron spout off about British values and then claim that those values are Democracy, Tolerance, Rule of Law, whilst they flout all three on a regular basis, one wonders what do they really intend. Especially when they are unable (or unwilling) to explain it in any logically meaningful manner. Speaking to school leavers from varied ethnic backgrounds, young people who have conversations across the globe without the adults interjecting, people who see that underneath all national identities we are human, people who understand that being humane is the first and only value of any real importance, young people who see that they are being targeted by these claims of British values; what they see is an attempt to create division amongst their contemporaries, to build a form of Capitalist Neo-Liberal Nationalism, that equates the flag and what it symbolises with ‘hard working families’ and ‘tolerance of others’, the right to own a home (to be indebted for most of ones life), the rule of brute force in International Politics (Iraq, Libya, Syria, Northern Ireland)… what they see is a demand that they adopt values they do not hold, values that are inhumane, that are at the root of the war mongering the British Government is engaged in. Tolerance, to tolerate suggests that those being tolerated are lessor, different, other. You will be tolerated as long as you toe the line and abandon your own sense of self in favour of the British Power Establishment. With 21% of the electorate giving total Power to an ideological band of robber barons actively dismantling the social contract that we care for the vulnerable in our Society, without the profit motive, and handing it to their friends to be turned to profit? British values – collusion with violent Militia, in Northern Ireland, in Syria, in Libya and elsewhere. British Values – protecting predatory pedophiles from public prosecution in order to protect the Power Establishment? British Values – Zenophobia stirred up by UKIP, the Daily Mail and others..
British Values – Trident ... as a 'deterrent', worthless and useless in practice. British Values – Institutional power over a people. British Values – low wages, subsidised by the tax payer, to improve profitability of British Corporations. British Values – a people coerced into debt through indoctrination, and economic sleight of hand, (right to buy, tax subsidies for mortgages) that owning a home is more important than spending time with one’s children. British Values – children cared for by well trained and well paid nannies for the wealthy rather than by their parents, and the children of the poor cared for by low paid, ill-trained childcare workers working for private enterprise. British Values – the elderly set aside from societal engagement and participation, held in ‘care homes’ run as profit centers. British Values – using the Rule of Law to abuse, control, dominate and coerce the population. ..although a human type of education is here to stay, it is most certainly not the prevailing type of education. So I would like to take a look at the two polar extremes of our modes of education and at the politics that is implicit in each of them. Before I go any further, I should say what I mean by the word ‘politics’. I am not at all thinking of political parties, or government organisations. I am using the term in it’s modern sense. We hear talk of ‘the politics of the family’ or ‘the politics of psychotherapy’ or ‘sexual politics’. In this present day sense, I believe that the word ‘politics’ has to do with power or control in relationships, and the extent to which persons strive to gain such power – or to relinquish it. It has to do with the way decisions are made. Who makes them? Where is the locus, or center, of decision making power? Politics concerns the effects of such power oriented actions on individuals and systems. If we think of the political characteristics of education, the traditional mode is at one end of a continuum, and a person centered approach at the other. 1. The teachers are the possessors of knowledge, the students the expected recipients. 2. The lecture, or some means of verbal instruction, is the major areas of getting knowledge into the recipients. The examination measures the extent to which the students have received it. 3. The teachers are the possessors of power, the students are the ones who obey. 4. Rule by Authority is the accepted policy in the classroom. 1. The leaders, or persons who are perceived as authority figures, are sufficiently secure within themselves and in their relationships to others that they experience an essential trust in the capacity of others to think for themselves, to learn for themselves. 2. The facilitating persons share with others – students, and possibly also parents and community members- the responsibility for the learning process. 3. The focus of the learning center is primarily on fostering the continuing process of learning. The content of the learning, whilst significant, falls into a secondary place. This was written by Carl Rogers between 1972 and 1979. In the late 70s and early 80s, as the person centered approach was spreading across the UK. Keith Joseph’s concern in 1984 was that people should be educated to ‘know their place’. To that end he redirected Educational policy along ideological lines, to ensure that the concerns of power and the 'economy' as understood by power were to be promoted, rather than in the best interests of our children as people in development. "Evolving Consumers'as a technical term for children. Neo-liberal revolutions at home were to be crafted through indoctrination, and economic falsehoods and gimmicks, as opposed to the imposition of Neo-Liberal revolution through violence, as in Chile and as so many other cases reveal. Thatcher had a ‘soft spot’ for Pinochet. David Cameron was sent to South Africa to do her business with the Apartheid Regime. Tony Blair reworked the meaning of Labour to integrate Neo-liberalist ideology into it’s executive behaviour. That concern remains present in current education, in much mainstream media and in politics. This concern is what drives the so-called ‘Greek Debt Crisis’ which is in truth a crisis for the IMF in that it’s imposition of Neo-Liberal Economics breaches Human Rights Law, is causing real harm to real people, and is therefore illegal. (the law under which these loans are set up is English Contract Law). Iraq was an illegal war of aggression. So too the bombing of Libya. Power Rules and the people must submit. The fact that Power uses our taxes is besides the point, is not up for rational discussion, let alone any rational discourse based on the evidence of adverse outcomes of the uses to which the Executive puts those taxes, which are after all a shared community resource.